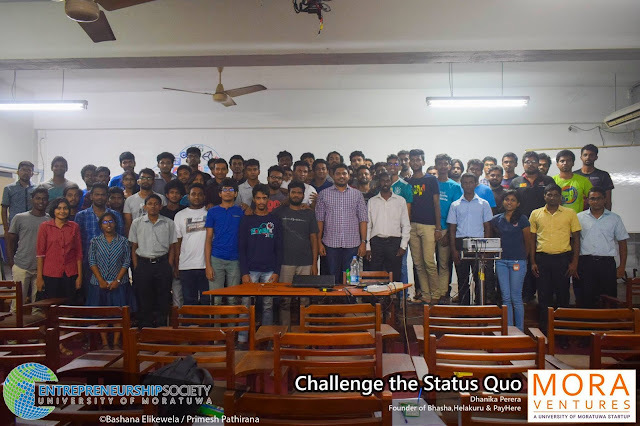 “Challenge the Status Quo”, an entrepreneurial motivation session was successfully conducted by Dhanika Perera on 6th February 2019 at University of Moratuwa. 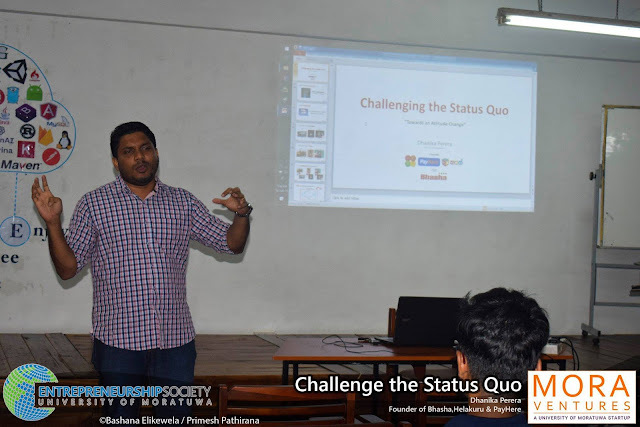 It was the third of a series of informative lecture sessions organized by the Entrepreneurship Society of University of Moratuwa for the year 2019. Dhanika Perera is a graduate from the Department of Computer Science and Engineering in University of Moratuwa and the founder and CEO of award-winning ventures namely Bhasha.lk, Helakuru, and PayHere. Recently his team initiated their new platform Hapan, a kids’ Sinhala Learning App which has already shown a significant favourable market response. The session was focused on the importance of challenging the status quo for an entrepreneur. Dhanika shared his own personal experience on the matter with the methodologies he used to address the problems in the existing status of the society for his products. Throughout his speech, he emphasized that “Entrepreneurship is not a skill but an attitude”. According to him, any existing problem is an opportunity for an entrepreneur and with the right mind-set and passion, anyone can succeed. “Challenging the status quo is essential for the advancement of the mankind. People who are crazy enough to think they can change the world are the ones who do. Entrepreneurs should think outside the box and find novel solutions to existing problems while foreseeing the future.” he said. “An entrepreneur should always exhibit the quality of perseverance as the multitude of challenges faced in the journey towards success could only be tackled with patience and perseverance. Self-motivation in this is very critical. In order for a product to be successful, it should be provided at the right time and at the right place, to the right crowd. A product should always be developed with a business model. With the right business model, even free and open source software could be profitable.” he added. The story behind his success and his perseverance through challenges was a true inspiration for many to-be-entrepreneurs. He related his journey from his very first product, a website named “maanawaya.lk” to his most recent achievements. His first commercial product was called “SETT Browser”, a browser designed to view websites in Sinhala and Tamil languages. It had drawn the attention of Etisalat Sri Lanka by winning the mBillionth Award South Asia for 2011 and was later bought by Etisalat. Dhanika’s most popular product, Helakuru was created to enable Sinhala language texting via smart phones while PayHere was designed to overcome the problems locals face due to e-payment limitations in Sri Lanka. Concluding his presentation, Dhanika mentioned that the true happiness of an entrepreneur lies not in money but in helping to change the world through his products or services while reaching the hearts of many. The inspiring words from Dhanika were of prodigious value to the budding entrepreneurs who were present on the day. Entrepreneurship Society of University of Moratuwa extends its heartfelt gratitude towards Dhanika Perera for sacrificing his valuable time and selflessly sharing his knowledge with the audience.